The 26 bones, 33 joints and 100-plus ligaments, tendons and muscles in your feet take a beating over the years. Some of the most common foot disorders you may suffer at some point are calluses, corns and foot pain. According to the National Institutes of Health, wearing ill-fitting shoes is the most likely reason you'll develop a foot problem. 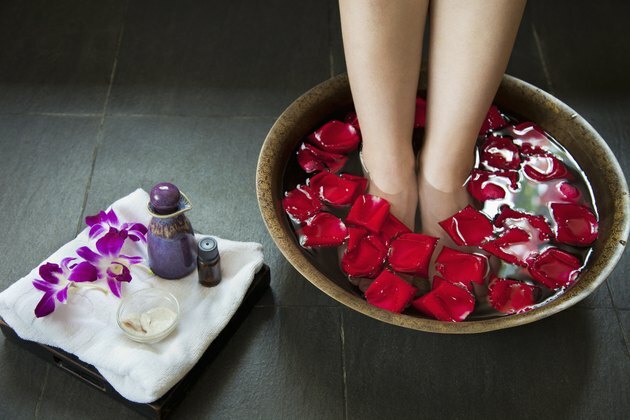 A foot spa is an easy way to help your weary feet recover. Always place your foot spa directly on the floor when you're using it, recommends Conair, makers of the Relaxing Spa Foot Bath. Remove any soft mats or carpets so that the foot spa remains level at all times. Use your foot spa indoors only, never outdoors. The best location to use your foot spa is in a cool, open area of your home, away from any sources of heat. An open location prevents the air openings from becoming blocked, causing your foot spa to overheat. Make sure you have a comfortable chair to sit on and never use your foot spa around children or pets. Once you've found the perfect spot for your foot spa, it's time to start pampering those tootsies. Fill your foot spa to the maximum water level allowed. Plug it in and turn it on before putting your feet in, advises Conair. Allow the foot spa to warm up to your desired setting. Have your foot hygiene products nearby so you don't have to interrupt your treatment. Some foot spas allow you to add oils or salts for extra soothing -- or you can add ionizing coils to promote detoxification. Follow the directions for using your particular foot spa. If you're also doing a pedicure, make sure you soak your feet thoroughly before using a pumice stone or other dry-skin-remover tool to minimize damage to the skin on your feet. Once your foot spa session has ended, remove your feet from the spa first before turning it off or unplugging it. While a foot spa can be very soothing for aching feet and enhance your pedicure, not everyone should enjoy one. You should not use a foot spa if you have a condition such as diabetes, poor circulation in your feet, varicose veins, an infection, or open cuts or sores, states the Environmental Protection Agency. If you have a pacemaker, you should not use an electrical foot spa. You should always clean your foot spa after using it to prevent infections, warns the California Department of Consumer Affairs (CDCA). A common infection from foot spa use is skin boils caused by bacteria such as Mycobacterium fortuitum. Eventually the boils produce pus and leave open wounds, states the CDCA. Each foot spa model has its own cleaning instructions. For instance, some can be cleaned with detergent or disinfectant while others cannot. Follow the instructions for your model.